Is there anything better on a hot day than ice pops? 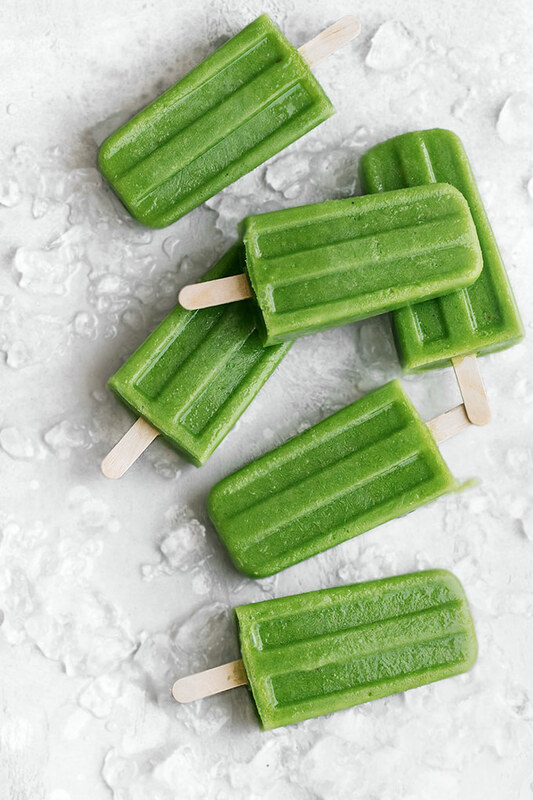 These healthy Green Smoothie Popsicles are going to be in my freezer all summer! 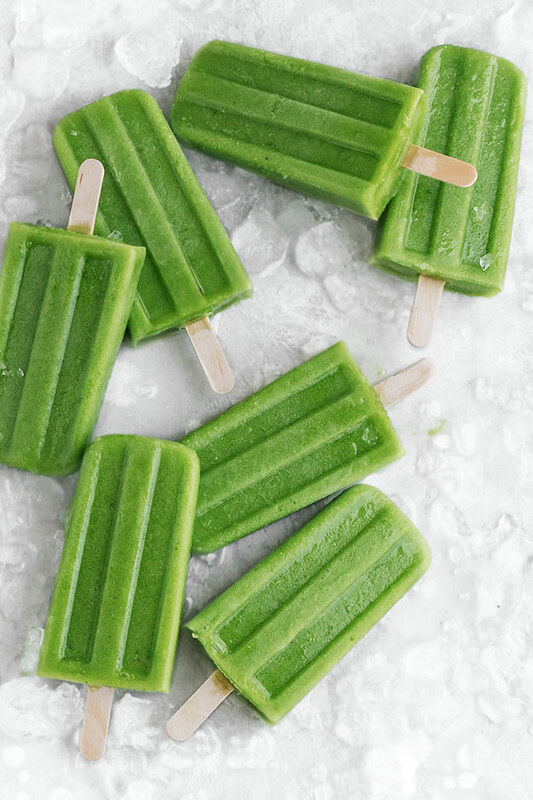 Green Smoothie Popsicles are my new favorite summer treat! They are not only super refreshing, cooling, fruity, and delicious, they are also super easy to make! Fruit popsicles are so full of nutrients, you could serve them for breakfast in place of a smoothie or as a healthy snack. Even kids will love them! How do y0u make smoothie popsicles? This recipe could not be easier and requires just six ingredients: pineapple, banana, baby spinach, orange juice, coconut water, and a little bit of fresh ginger. Once everything is blended, simply pour the mixture into popsicle molds and freeze for four hours or overnight. If you don’t have a popsicle mold, no worries, there are several things you can use: small paper cups, ice cube trays, empty yogurt containers, or even a muffin pan. Fill the container 3/4 of the way full with the popsicle mixture, cover the top with a small piece of foil, and freeze for about 1 hour. Then cut a small slit in the center of the foil and carefully insert a wooden stick. How do you remove popsicles from molds? There are two ways to unmold ice pops. Fill a large bowl that is at least as tall as your mold with warm (not hot) water, and briefly dip the mold in until the pops loosen (about 20 to 30 seconds). Remove the mold from the water and gently tug on the popsicle stick. If the popsicles remain in the mold, leave the popsicles in the warm water a little longer. Another method is to run them under warm water for 30-60 seconds. It’s important not to run them under the water for too long or they will melt. Popsicles might be slightly softened after removing, especially if you had to run warm water on the outsides of the mold. 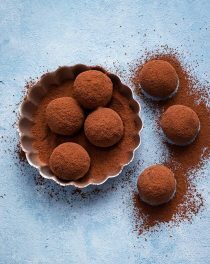 Place them on a baking sheet covered with parchment paper and refreeze for 15 to 20 minutes or until completely hard again. Then store them in a large ziplock bag or airtight container using wax paper to layer them. Keep a stash in the freezer, and you’ll be ready for warm afternoons by the pool! This recipe is easily adaptable. Smoothie popsicles are a great way to use up leftover smoothies or turn your favorite smoothie recipe into a refreshing treat. Try other greens in place of spinach. Baby kale, watercress or even lettuce would work. Don’t have coconut water? Just use water, apple juice, or almond milk. You can make these with fresh or frozen peaches, melons, kiwi, or mango. If you want a vibrant green color, avoid mixing red fruits with green ingredients, or your smoothies may turn brown. 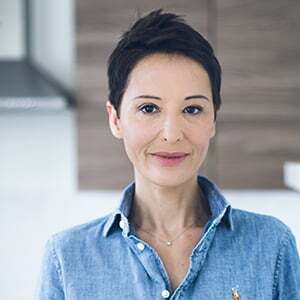 Pineapple and banana provide enough sweetness for my taste, however, depending on your fruit and your own preferences, you may want to add a dash of honey or agave. Taste the mixture before freezing it and keep in mind that the sweetness will mellow once frozen. What’s your favorite popsicle flavor? 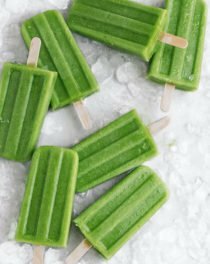 If you make this Green Smoothie Popsicles and love them, please leave a comment and give this recipe a rating! 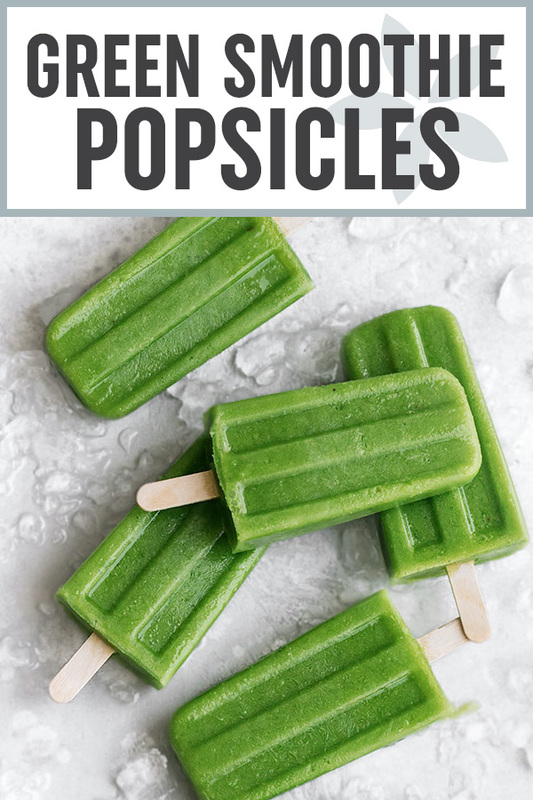 These homemade green smoothie popsicles are not only refreshing, healthy, and delicious, they are also super easy to make! Smoothie ice pops are so full of nutrients, you could serve them for breakfast or as a healthy snack! 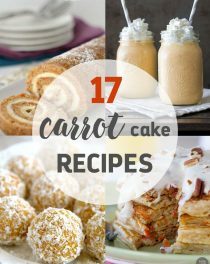 Even kids will love this recipe! Place the ingredients in the order listed in a blender and blend until smooth. Pour the smoothie into the popsicle mold, cover, and freeze for 1 hour. Insert the wooden sticks into each cavity and freeze for another 4 hours or overnight. To remove popsicles from mold - Fill a large bowl that is at least as tall as your mold with warm (not hot) water, and briefly dip the mold in until the pops loosen (about 20 to 30 seconds). Remove the mold from the water and gently tug on the popsicle stick. If the popsicles remain in the mold, leave the popsicles in the warm water a little longer. Freeze or eat immediately! 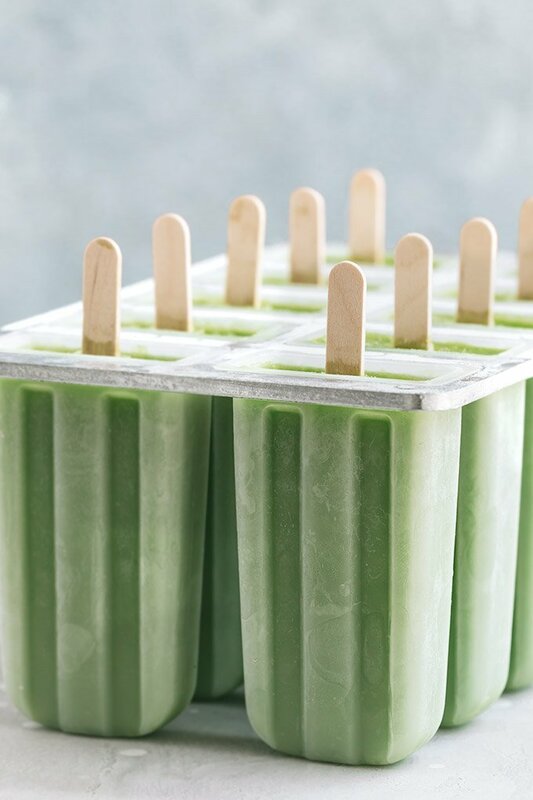 The recipe makes approximately 10 popsicles, depending on the size and shape of your molds. These are so perfect for summer. 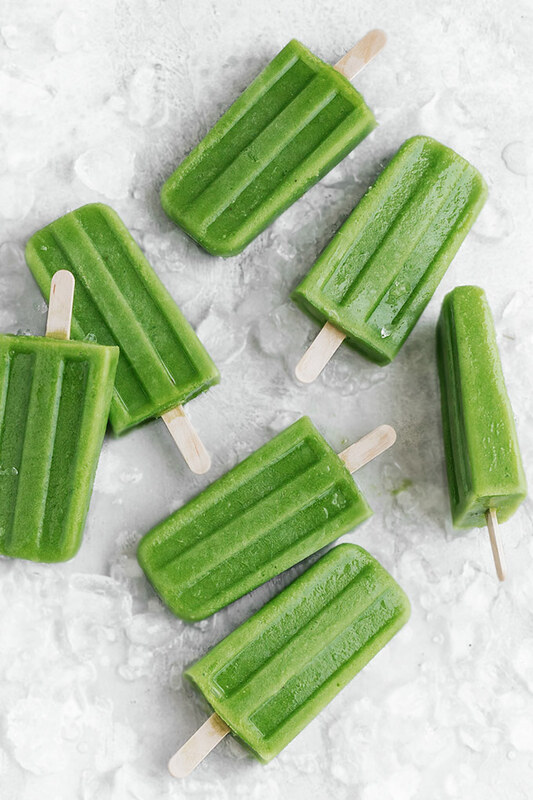 I need to make them for my kids as they don’t like spinach much, but I think they would gobble these popsicles down in no time. What a fabulous healthy snack idea! And a great way to sneak in some extra nutrients for kids. great tips for removing the popsicles! also I’m obsessed with the color of these popsicles! What a smart breakfast idea! Perfect for these last few weeks of summer! My son love the manggo,banana and lowfat milk.Good for summer. 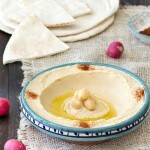 Really lovely and fabulous healthy snack idea! And a great way to sneak in some extra nutrients for kids.